Core is a walking bipedal robotic vehicle. Created by researchers at fuRo (a division of the Chiba Institute of Technology), this prototype can carry up to 220 pounds. Core's unique feet are equipped with a newly developed shock-absorbing mechanism. These "shock feet" consist of one shock absorber steerable parallel with the four absorber steerable independent; 80% of the impact force for each landing leg can be absorbed. The intent is to create a mobile vehicle that could act as "legs for the elderly", helping older people move conveniently on uneven terrain. Technovelgy readers no doubt remember the HUBO FX-1, a walking robot. 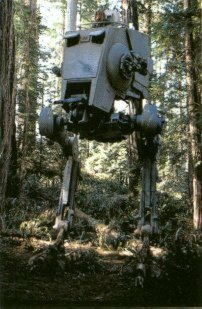 I'll bet Star Wars fans are thinking about those multi-legged walkers like the one pictured below.